Sun energy waves can be divided according to their physiological affect on the skin as well as the depth of skin penetration. 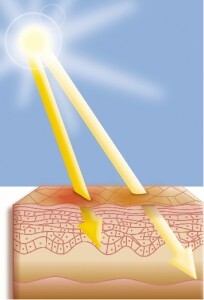 UVAI (340-400nm) can cause tanning but has minimal erythemal effect. It penetrates deeply and can cause long-term damage. UVAII (320-340nm) has a slight erythemal effect. 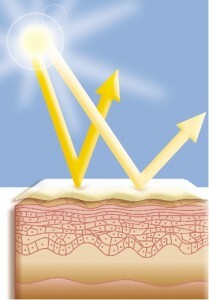 UVB (290-320nm) causes sunburn and is a major contributor to skin cancer development. 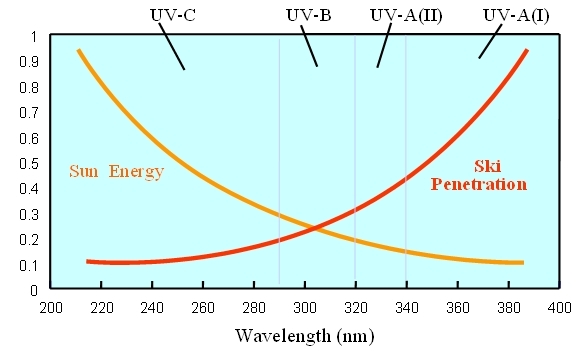 UVC (200-290nm) is very energetic radiation which is absorbed by the ozone layer. In less scientific words, sun radiation penetrates the skin and causes sunburn, long-term skin damage, and possibly skin cancer. The Nidaria R&D team has developed a range of topical sunscreens that reduce or eliminate the skin penetration of UV radiation. The Safe Sea Suncare product line includes a range of sunscreens providing low protection for daily use under moderate sun, up to ultra protection from UVA / UVB during extreme sports, skiing and mountaineering, or on vacation on tropical beaches. All our products have been clinically tested in accordance with FDA., EU and Japanese regulations.